How many ice ages? more than one expert says: "One"
How to make an ice age? Snow, lots of it. How to make snow? Warm water contacting a cool atmosphere..
As part of the Flood event itself and for a century afterwards, snow blanketed the higher latitudes and Polar regions as part of the Catastrophe. From what we can tell, the first earth had no rain or snow prior, so how do we get a glacier without snow and more than that - an Ice Age? Think of it, how warm would the oceans be if we had a tropical climate in both Siberia and Antarctica, with both areas growing Redwood trees! What would happen if a previously warm but now 100 degree below zero atmosphere made contact with warm, 80 degree oceans? When you place hot water in a freezer what do you get? - evaporation and steam! (see image below) Consider what this massive amount of water vapor rising and contacting the cool atmosphere would result in. Massive snow storms at the higher latitudes at both poles. The oldest book in the Bible (Job) mentions ice, frost, and snow - in the Middle East! Over time, the earth's weather systems stabilized to leave us the cycles and temperate zones we have today, but even those are changing, getting slightly warmer over hundreds of years. We know the glaciers are receding and the deserts are growing. From the author's experience living in Alaska in the 60's and flying across the largest ice fields in North America, one could observe the moraines that proved ice covered much more of Alaska in the past. Such were also recorded by the early explorers like Cook. Some folks panic over this natural process… If they think global warming is an issue, try global cooling! All the major cities in Alaska would be under ice if the earth had not warmed after the flood event. Warming is not such a bad thing, but certainly reasonable efforts to maintain a clean atmosphere is just good stewardship of our Blue Planet. On the other hand, in the last 14 years the Earth has seen a cooling trend, even Alaska is setting records for low temps for longer durations. Dr. Maynard Miller, one of America's foremost glaciologists, documented that no ice on the planet exists older than 6,000 years. When asked about the polar ice sheets and their age, he stated that old age calculations were inaccurate due to homogenization of the deep cores, (in reading the current literature one can see contradictions) where they switch from actual to assumed deposition based on core depth and average rates of snowfall. Snow deposits would have been far higher during and after the flood than now. If the aquifer water sprayed high into the atmosphere in the first 40 days, it would have created massive initial snow deposits and jump-started an Ice Age, most likely the only Ice age. This would account for the Polar and Greenland ice caps being formed with fresh water and account for those massive initial sheets and the devastation they brought to those areas. When this sequence is taken into account, it answers many questions about the past in a logical and verifiable way. Ice cores show extensive dust pollution at the bottom, even pine needle intrusion, suggestive of terrific storms forming the bottom most layers. See more in The Noah Code. 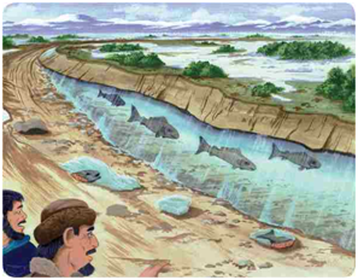 The pre-flood hydrological cycle was completely different than today of evaporation, rainfall, and runoff. According to the Bible, there seems to have been an underground aquifer/spring network and a morning/evening dew/mist that watered all the land. (see First Earth and Genesis 2:6,10) Around the globe we find caves and caverns that are now unused and empty. Could these be the remnants of the first hydrological system? New evidence supports a theory that our planet had a subterranean aquifer network that was "pumped by the tidal action of the moon acting on the crust" in the first world. This strongly supports the Bible's account. (see Dr. Brown video). The soil of Siberia is so full of mammoth bones that "ivory mines" were working for many years, at least 20,000 tusks were taken from one mine alone. Besides mammoths, the Arctic soils contain the remains of over 60 animal species, including the woolly rhinoceros, camels, horses, tigers, and antelope. Many of them lie in frozen silt, mixed together with boulders and tree roots. The article goes on: "Apparently, at one moment the mammoth was munching away peacefully at butter-cups growing lush in the sunshine of a temperate plain. The next moment it was subjected to cold so bitter that it was deep frozen where it stood, buttercups in mouth." Their body tissues and stomach contents had not even begun to decompose, as thousands of years later, buttercups were so found. If we look for the bones and ivory of the mammoth, not just preserved flesh, the number of discoveries becomes enormous, especially in Siberia and Alaska. Nikolai Vereshchagin, the Chairman of the Russian Academy of Science's Committee for the Study of Mammoths, estimated that more than half a million tons of mammoth tusks were buried along a 600-mile stretch of the Arctic coast alone. Their meat still edible. 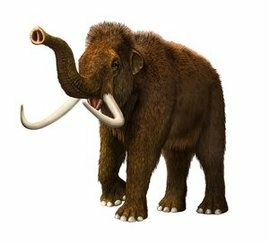 (1) Scientists have found mammoth tusks embedded with millimeter-size particles rich in iron and nickel. 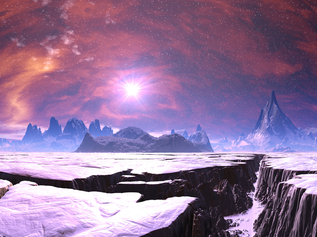 The BBC stated, “Startling evidence has been found which shows mammoth and other great beasts from the last ice age were blasted with material that came from space.” As the "great deep" exploded into space, it would be expected that the poles would get the brunt of such returning particles. It should also be noted that meteorites with proteins have also been identified, explained as above, not being evidence of life forms from other planets! Fossil Fuels Where did they come from? These would be needed for man to survive in the new and cooler planet. Coal, gas, and oil deposits may be found in abundance on nearly every continent in the world, and in many places layered upon each other! We shouldn't take them for granted, they are a gift from God! None existed in the older earth before the flood event horizon (see Grand Canyon segment). They are recent in age, water sediment covered, and all a result of the Flood! 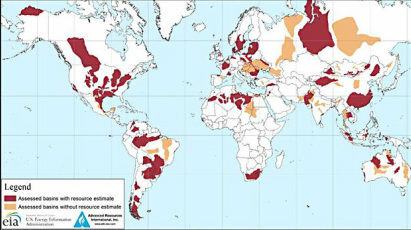 Fossil fuel maps often don't even reflect the massive undersea deposits! One underground coal mine in Kentucky, USA recently was forced to close an entire section due to a breakthrough into an oil pool. (1) These deposits are not a mystery and date to a time period following the flood. In summary, the Earth was broken and stripped clear of all life and vegetation in the Flood of Noah. God is serious about the way we live our lives. The rebellion and terrible sin the people of that era were reprehensible to His ways. He finally declared an end to it. Later, when Jesus Christ came he spoke of the same Flood and connected the two to a Second Coming event, the next Judgement. We cannot ignore his teaching or the evidence of the past. ​Find yourself in this Picture!